The fan-favorite anti-hero from AVENGERS: INITIATIVE explodes into his own mini-series! Taskmaster has trained hench-thugs for every terrorist organization and criminal cartel in the Marvel Universe. So when the rumor starts that he's turned traitor and now works for STEVE ROGERS, a billion-dollar bounty is put on his head, and every cadre of costumed fanatics -- A.I.M., Hydra, Ultimatum, the Sons of the Serpent, everyone -- looks to collect. Now Taskmaster has to fight hordes upon hordes of his psychopathic students while at the same time figuring out who framed him -- which requires him figuring out who he really is! That's right, the man with the photographic reflexes has no memory of his true identity -- and you'll learn the unexpected truth along with him! 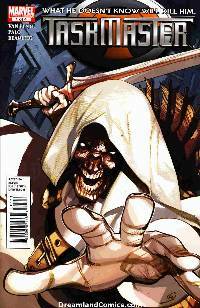 The action-packed SECRET ORIGIN of Taskmaster begins here, courtesy of New York Times bestselling writer Fred Van Lente (AMAZING SPIDER-MAN, INCREDIBLE HERCULES, MARVEL ZOMBIES) and acclaimed artist Jefte Paolo (DOCTOR VOODOO)!